FlikFlak watches has been around since 1987. They are under the umbrella of the Swatch Group. 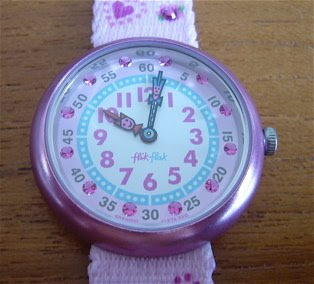 The concept behind FlikFlak watches was to teach children how to tell time. The hour are clearly indicated as are the minutes in 5 minutes markers. 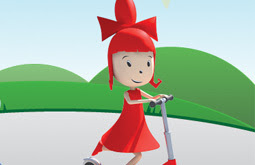 To aid children, the characters Flik (a boy) and Flak (a girl) were introduced. Flik, being older, is taller, hence the minute hand and Flak, the younger sister is shorter, the hour hand. 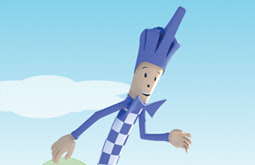 Flik rendered in blue and white, while Flak is in red. 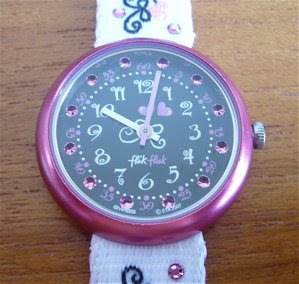 The FlikFlak range of watches covers ages 3 to 9 with the FlikFlak Cute size catering for the 3 to 5 year olds. The next product line is the FlikFlak Preschool. This caters for the 6 to 7 age group. To round up the product line is the FlikFlak Full Size. This is for the 8 and 9 year olds. 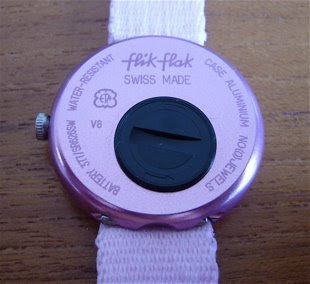 The interesting point of FlikFlak watches are they can be machine washed (up to 40°C). All you have to do is to put the watch in a sock and put it in the washing machine. The watches are also shock proof. This is a review of a couple of FlikFlak watches. The first is the FlikFlak Monde Enchante. The model number is FBN046. It is part of the 2007 Fall Winter Collection. The watch is powered by a quartz ETA movement. The watch has a diameter of 30 mm and is 8 mm thick. 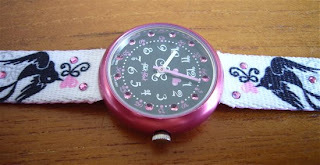 The strap size is 14 mm. The crystal is scratch resistant mineral glass. The case is made of aluminium. It is pink in colour. The crown is matte aluminium. The crown extends slightly from the case. This allows for easy operation. The mineral glass is decorated with pink crystals. The crystals are mounted on the underside of the mineral glass. 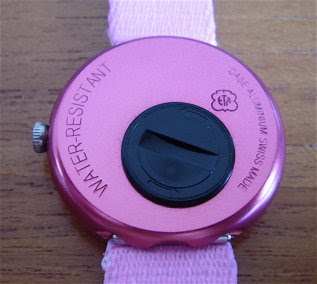 The dial is brightly coloured, pink blue and white. The minutes are clearly marked, as the hour markers. Flik is the minute hand and Flak is the hour hand. It is very easy to read the time. At the 6 o'clock position we can see the wordings 'SWISS' and 'ETA 2006'. This indicates the watch is Swiss made and is powered by an ETA movement. 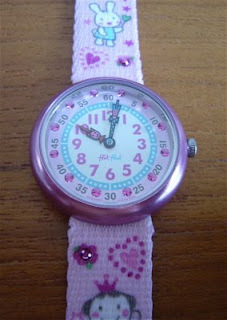 The 2006 indicates that this watch was designed in 2006. 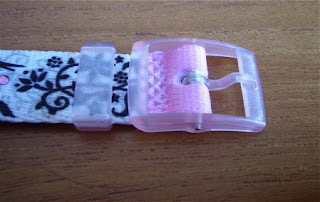 The band is made of plastic covered by cloth weave. 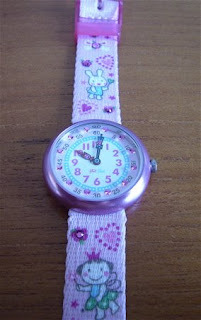 The band is decorated with hearts, flowers, crystals, rabbits and witches, all characters in line with the watch name, Monde Enchante. The band is pink in colour. The band is held in place by pins. To remove the band, just push out the pins. The case back is beautifully decorated. The engraving is very good. Information on the case back includes the FlikFlak signature, made in data, case material, battery information and the ETA logo. Battery change is via a battery hatch. 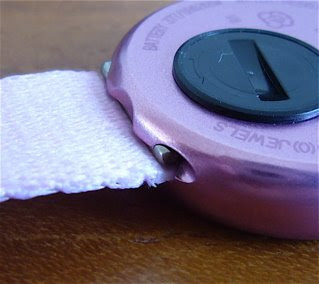 The buckle and the keeper is made of clear pink plastic. 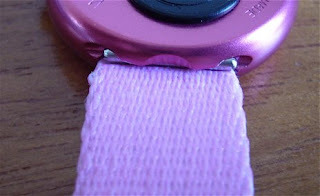 The buckle is of the loop over design, thus ensuring a positive and firm locking of the band. The keepers has the FlikFlak signature on the top and bottom. The quality of the buckle and keeper is very good. 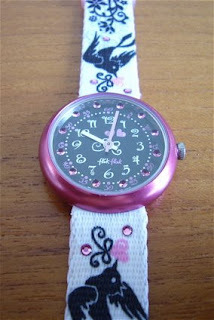 The next watch is the Summer Birds model. The model number is FSN014 and is part of the 2007 Spring Summer Collection. As with the Monde Enchante, this watch is also powered by an ETA movement. The dimensions are the same as well. 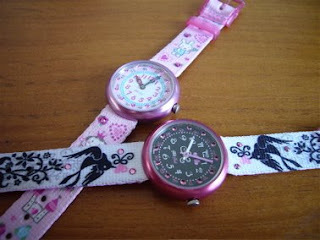 We shall look at the differences between the 2 watches. The case is also pink but darker as compared to the Monde Enchante. The dial is black and white. The minute and hour markings are still present. However the hands are not Flik and Flak but more contemporary in design. The hands are still differentiated by colours, pink for the minute hand and white for the hour. 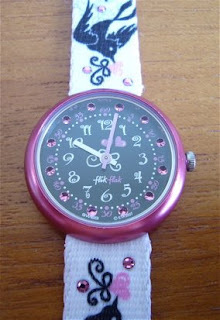 This watch was designed in 2007 as shown by the markings at the 6 o'clock position. The black and white theme of the dial is carried over to the bands. The bands are decorated with crystals, birds and flowers. The design of the bands is the same as the Monde Enchante. This is where to me anyway, the watch fails. The case back is just bad when compared to the Monde Enchante. Gone are all the beautiful engraving. Even the FlikFlak signature is not longer on the case back. All we find is the ETA logo, Swiss made, case material and water resistant. The engraving is also not consistent. The battery hatch is still there. The buckle is the same design. It is lighter in colour as compared to the Monde Enchante. Overall, I find the FlikFlak watches interesting. It does help the children to read time. They are robust and the fact that it can be washed is a bonus. 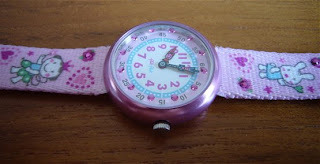 The watches are light and the child will not notice that the watch is there. The child will not be too worried about the watches and will just continue doing what children do best, have fun.